One year after Duckett came out with the Micro Magic they have came out with a new series of rods that are a little bit lighter and a little more sensitive with input from pro anglers to raise the bar again. The new Duckett White Ice Rods feature double helical bias construction and a low resin graphite blank, stronger microguides, a new lightweight reel seat, and a new EVA grip that is lighter in weight and has a rougher texture to ensure a good grip. 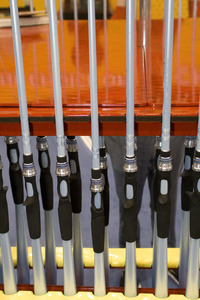 The White Ice Rods are designed for and endorsed by one of today's top bass anglers.